The former barber's shop is a small timber building located on the south west side of Glendinning Street in the centre of Balmoral. The shop has a recessed entrance with a returning shop window divided into three large panes and eight small panes above. There is also a two paned double hung sash window to one side. The shop also has a very simple weatherboard parapet or pediment. The former barber shop is the second and only surviving example of a barber shop in Balmoral. It dates from the 1930s, and was run by local identity, Charles Bloomfield for many years as a barber and bootmakers shop, and later as a sub - branch of the important agricultural store Dalgety's Farmers. The building is currently unoccupied, but retains a high degree of integrity and is in relatively good condition. 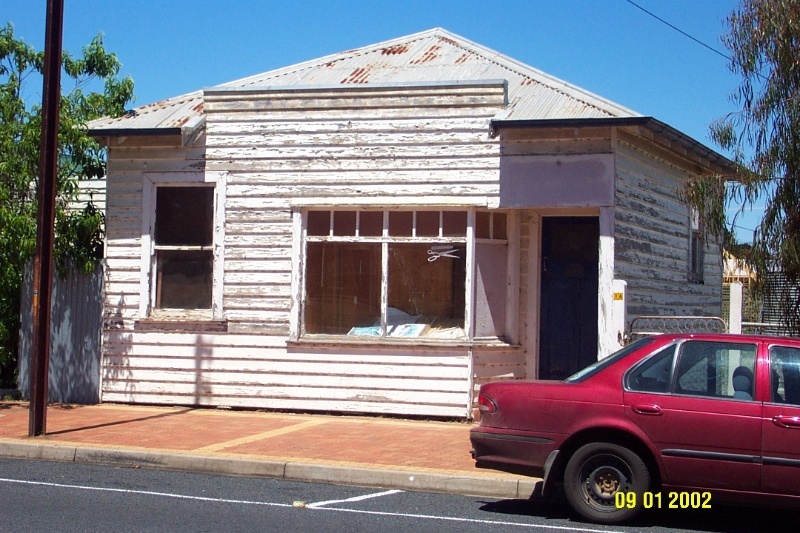 The former barbers shop is of historical significance to the township of Balmoral and the Southern Grampians Shire. The former barbers shop is of historical significance as a rare surviving example of a 1930s shop in Balmoral. It is of further importance for its associations with the local Bloomfield family, particularly Charles Bloomfield who ran a barbers shop and bootmaker from the premises for many years. The shop is also of historical significance for its role as a sub-branch of Dalgety's Farmers, one of the most important agents and suppliers of equipment to people on the land throughout the twentieth century. The shop is a small timber building with a low-pitched, corrugated iron roof. The recessed entrance is to one side and there is a returning shop window subdivided into three large panes and eight small panes above. There is also a two paned double hung sash window to one side. The weatherboard facade extends through the eaves line in the centre to form a very simple parapet or pediment. Charles Bloomfield, hairdresser, first and only owner.